JP 2008-04-22 800 points ? US 2010-03-15 900 points ? EU 2010-03-19 900 points ? AU 2010-03-19 900 points ? 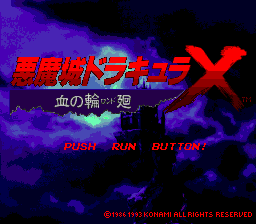 Akumajou Dracula X: Chi no Rondo (悪魔城ドラキュラX血の輪廻) is an action game. A remake was made exclusive to PlayStation Portable years later, where it was localized in the West as Castlevania: Rondo of Blood. Rondo of Blood is set in 1792, nearly a century after the events of the original Castlevania. Unlike its predecessors, gameplay now uses a new item system, along the player to use more powerful attacks based on what item they have on hand. This was also the first game to employ the use of voice acting and cutscenes. Due to the game's initial release in Japan, it was relatively unknown outside of its home country until the release of Symphony of the Night four years later on the PlayStation. Uses animals to attack with rather than the traditional subweapons. This page was last modified on 26 December 2017, at 21:10.